General Foot Care | Foot & Ankle Associates of Florida What to look for in a podiatrist? The very first thing to look for in a podiatrist is his or her credentials. Podiatrists are foot and ankle doctors who have earned their doctorate in podiatric medicine (DPM) and completed a surgical residency. Depending on your foot care needs, you may also wish to look for one who is trained, experienced, and board-eligible or board-certified to perform surgical procedures. 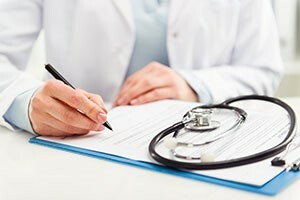 Beyond checking qualifications, you want to find a podiatrist who has a good reputation with his or her patients. Reviews and testimonials can help with this. Additionally, an office location that is convenient for you is also a plus. At Foot & Ankle Associates of Florida, we make it easy for you to find everything you need in a podiatrist at our Central Florida offices. We are proud to be staffed with experienced, skilled, and compassionate foot doctors who provide effective care for all of our patients. Request your appointment with us by calling 407-339-7759 or 352-589-9550 (if you are calling from Lake County) and our call center will be glad to assist you. If you’d prefer, use our online form to request an appointment today at our Orlando, Kissimmee, Altamonte Springs, Lake Mary, or Tavares, FL locations. What conditions can a podiatrist treat? Heel pain. Heels face tremendous amounts of pressure, so heel pain is common from conditions like plantar fasciitis, Achilles tendinitis, and Sever’s disease. Sports injuries. Foot and ankle injuries are always a risk in sports. We treat injuries like sprained ankles, turf toe, and fractures. Toe deformities. Bunions, hammertoes, and claw and mallet toes will get worse over time unless treated. Nail and skin conditions. There are various skin and toenail issues that can develop, including ingrown nails, fungal nail infections, and cracked skin. There are, of course, many lower limb issues which do not fall into these categories, such as arthritic conditions, diabetic foot care, or neuropathy. However, the important thing to keep in mind is that if you are experiencing pain or difficulty in your lower limbs, Foot & Ankle Associates of Florida is the place to come. We can provide the treatment you need at any of our Florida locations: Altamonte Springs, Kissimmee, Lake Mary, Tavares, or Orlando. Call us for more information at 407-339-7759. If you are calling from Lake County, dial 352-589-9550.